A double swim, nice and sociable... we might even catch a fish! It was interesting reading John Bailey's thoughts about this season's tench fishing in the Angler's Mail the other week. He was basically saying how dire the fishing had been for the species.. and I think I'd add to that, and say for most species? Saying that, I think the rivers have been in better form lately than stillwaters... how have you guys found it? John then ran through some of the unseasonal statistics for earlier this year, with some months being the wettest, or the coldest, for quite a while... and as most of us who've been on the bank regularly, don't we know just how unsettled it's been out there! Am I looking for excuses... no, but it has been bloomin' frustrating! Gary and me can catch fish, and I know we've picked a hard water or two for this years tench/carp campaign, but boy we've struggled. With regular trips to our chosen lake in Bedfordshire, and even swapping for a couple of sessions on another club water close by, hasn't helped us much. Well Gary did hook one reasonable cat, but as he steered into the net, his hooklink snapped, only for the net to get caught in weed and me not able to lift it as the cat turned tail and made its escape... sorry mate! But that's how it's been going, and when we got out the following week, it was just as crazy. Heading for this same lake again, with thoughts of getting amongst the cats again, it was only as we got to the end of the road near the lake that we could see the place was rammed! Now one of the main reasons Gary and myself pick these waters is obviously for the fish, but also for the solitude, with just one or two other anglers usually sharing the water, as after a hard week at work, we want a venue with some peace and quiet. So, we didn't really have a choice, it was back to our original lake. And even then, on arrival we realised that they'd closed off one side of it for other activities, so we were forced along the bank where we'd tried before, and not had much luck, and it was also quite heavily weeded. Oh well, thinking our options were becoming limited, we picked a double swim, might as well have a social, put the world to rights, and get the kettle working overtime. A nice 'slab' at 11lb 9ozs, perhaps the first of many? 'Hmmm, looks like we could be bream fishing then?' is my reply. Gary positions the marker at a reasonable distance, in the centre of the swim, and it's not long after that we lay down a loose bed of pellet with the catapults. The plan is for us to fish a couple of rods each, on either side of the marker, with hope that the bream will graze across this patch of gravel/silt in front of us. We don't stop there, as it's a four rod limit here, and as I'd brought a large carton of lobworms, originally for the cats, we both chuck out a bunch of worm into the margins, as this water must have eels in it, as the river Ouse runs round the back of the venue. As evening sets in our hunch is soon proved right, as there's a tug on Gary's worm rod, that carries on with intermittent beeps, and an indicator that bobs up and down, he holds the rod until he's sure there's a visitor, then strikes. A dogged fight ensues, but Gary's in charge, and we soon have this one in the net. It's nearly dark now, and after weighing we sack our lengthy friend for a mornings photo call. The eel goes 4lb 3ozs. I'm then on ghillying duty through the night as one of Gary's pellet rods seems to attract most of the fish in the area... or so it feels at the time!!! Around 11pm his alarm gives a short burst of activity, and he's in again, a short fight and we're looking in the net at a fair size 'slab'. The scales register 11lb 9ozs... and his net is well slimed! Within a couple of hours it's a repeat story, on the same rod, only as Gary steers bream number two towards the net it slips the hook, and all we're left with is an excuse to make some more tea! During all this time the other rods are giving out the occasional beep, and the odd liner, but only one rod is doing the business, and in the early hours it's off once more, with this run producing a reasonable tench of 6lb 4ozs. The kettle is working hard this trip, and as we glug down a warming cuppa, I'm joking that after an eel, a bream, then a tench, all he needs now is a carp... Gary smiles, and mutters that we're just coming into the best time for carp. I then mention that if catches a blooming carp next, he's going in after it! And then head for my bag, laughing. The carp doesn't appear, but there's one more fish to be had. Our worm rods have been getting little taps and knocks all morning, and we put this down to small stuff nipping at the worm tails, and after one big tug Gary pulls in to find his worms well chewed. Fed up with the constant little beeps, he decides to try a couple of maggots on the hook, and plops it back in to the same spot. With the Ouse nearby, it was a good bet this lake had some snakes in it! It lasts about half an hour, before ripping off, and soon another tench is laying on the mat. There's only one thing to do, and as the old saying goes, 'If you can't beat them, join them', I put out my own maggot rod... it sits there for the rest of the morning... and I don't get a touch, oh, how I love fishing! At least we caught two of the targeted species we went for... even if they did both come out to Gary's rods! Talking about John Bailey at the start of this story, I was lucky enough to get an invite to a filming session for the Fishing in the footsteps of Mr Crabtree series, which I'll be writing about soon, so keep an eye out for it. The plan was to switch to a bit of tench fishing once the weather had warmed up, and at long last it has... but boy has it been wet as well! We're fishing a lake in Bedfordshire, which Gary and myself had a go at for the pike a couple of seasons ago, and said then that we'd return to target the carp. So with us thinking about a venue to target tench, this club water started to climb the list. With double figure bream and tench, plus some good sized carp, this seemed just what we were after. Our first trip was a couple of weeks back, and we arrived mid-afternoon, heading for the more open side of the lake. I say that, as there's a long island that runs down the lake, more over to one side than the other, leaving a narrower channel around the back of the lake, and a big expanse of water on this side, which we thought would more likely hold the bream. This venue is a large water, and so has a four rod limit, something which I've not had a go at before. I've obviously used three rods for carp, and again on certain pike waters, but that was single species fishing, and we were going to try to cover a few options, as this was our first exploratory session here. Both of us were using two rods for the tench, with Gary trying a maggot feeder and a cage feeder on his two, whereas I'd be ledgering artificial sweetcorn on one, and a pellet on the other. All these baits were fished over a bed of groundbait that was spread across an area at the bottom of a deep trench that ran in front of our two adjacent swims. Next two rods were going out long distance. Gary fished a pellet with a small stick, while I tried a boilie and a bag of chops, both placed on clear spots out of the weed. 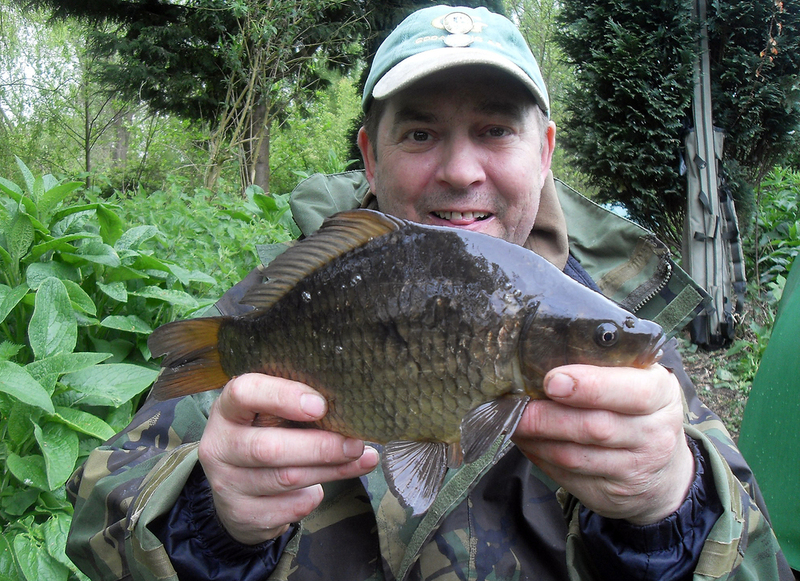 Hopefully the bream would move through the area, or at worst, the carp or tench. That left our last couple of rods, and as I said we were covering all bases... so with a river running around the back of the lake, and with the weather starting out quite muggy... it was a couple of big popped-up lobs that also ended up in the trench, that we hoped might give us an outside chance of an eel! So, we were going for just about everything that swims! And with all the different set-ups, rigs, baits, it took a fair while getting all those rods out. But once sorted, the kettle was fired up, and with a hot cuppa in hand we enjoy a quiet evening chatting, and watching the water. After all this you're probably waiting for the big payoff, and so were we, but as dusk fell, we heard the first few spots of rain tap on our brollies. And as we both nodded off the rain was getting heavier. In fact it didn't stop all night, it was just a question of what level it was at... downpour, bucketing... or flipping monsoon! 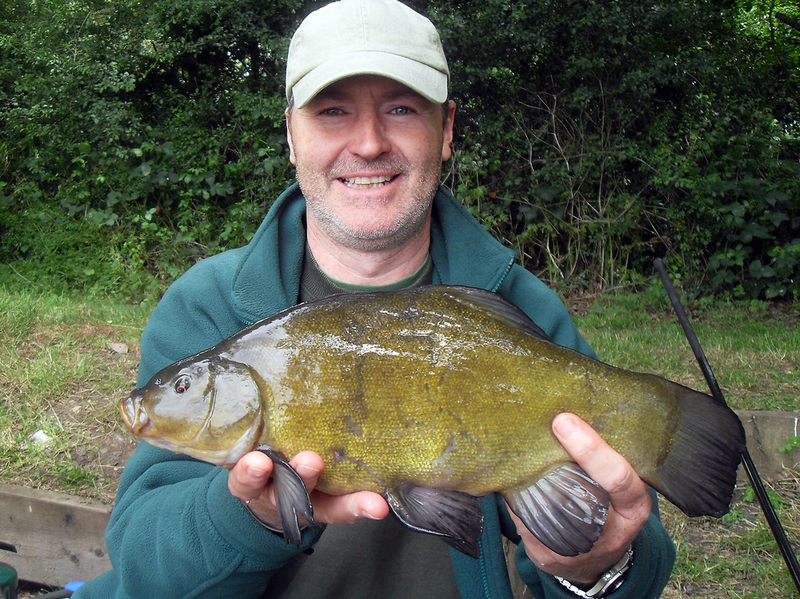 A welcome sight, not that he looks that happy... that's the tench, not Gary! We returned last week for our second session. This time we moved to the far end of the lake, on a little out cropping of bank, opposite the end of the island. Our thoughts being it would be a good place to possibly ambush the fish as they moved round the lake in the narrower channel between us and the island. We'd also become a bit more focused on what we were after, setting up just for the tench and carp. Gary was going maggot feeder on both his tench rods, and I did the same on one of mine, but decided to try the other fishing a strawberry mini-boilie. 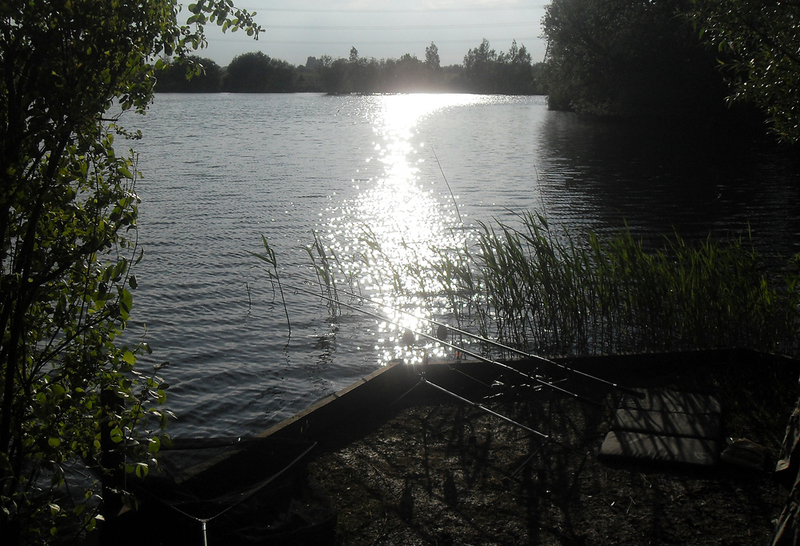 These rods were put out either side of our respective swims, which then left room for our carp rods to go up the middle towards the island. It seemed like the rain wasn't going to leave us alone this week either, but we were hoping it wouldn't put the fish down as it seemed to last week. Anyway we were dodging the showers as we set up, and things were looking good when Gary's alarm started screaming, as one of his carp rods ripped off. But it stopped just as suddenly, and we could only think that it had slipped the hook... but it was a run. And with fish topping in front of us, our hopes were high. Gary sets his alarm for 4am, to get us up to rebait, and with that we go for some shut-eye. There's heavy showers during the night, and when we rise to refill the feeders it's still drizzling. But the rods are reset and within the hour Gary's away again. This time it stays on, and I'm ready with the net. It's our first tench from the water, well done mate! It's not huge, a male, about 5-6lbs, but it's what we're after, and with a few liners before we leave, we know that the fish are in this area. With the weed coming up in big clumps through the channel we're planning on doing a bit of 'raking' next visit, which should give us some good areas to attract more tench. As it happens I can't make it out this week, as I'm doing my bit with the kids, but Gary gets back to the lake, and sets up in the same spot. I'm kept up to date with regular texts, of fish moving, raking, a lost carp, and then one of them turns out to be a picture... he's had an eel! It goes 4lb 4ozs, caught on maggot... well, they had to be there, perhaps there's a monster to be caught? We carping or tenching then, mate? Well, there wasn't going to be a straight answer. Gary and myself fancied some more tenching and the lake we were heading for holds 'tincas' to over 11lb... but trouble is, it also has carp to nearly forty pounds! So it's either fish light, and if we hook a whacker we probably lose it, or fish heavy and possibly scare off the tench... hmmm, well if we did hook a twenty or a thirty we might as well land it! Right then, June's arrived and it's time to brush off the dust from the bivvy and do our first night session of the season... load the car, rods, bedchair, sleeping bag, pillow, cooking gear, food, water, bait, barrow, pod, and of course the bivvy... think I've got half the house in there! It's about two in the afternoon and Gary rings to say he's at the lake, he fancies the bank round from the car park, but he's waiting till I arrive before setting up camp so we can both decide on swims... don't worry mate I'm on my way! Once there we agree this end of the lake looks good, there's a nice couple of swims that are fairly close (got to be within tea making distance! ), with Gary's giving him access to a nice snaggy area on one side, overhanging trees on the other, and an island not far out in front. My swim has a reed lined area nearby, the same overhanging trees between us and the island also in view, and above all else we have a nice breeze blowing in our faces... got to follow the wind eh? Gary favours an oval brolly to sleep under, me a small one-man bivvy I've had for a few seasons, so up they go and then out come the rods. I put out a popped-up boilie against the reeds, using a flavour from our mates at All Seasons Baits that we've been slowly feeding into the lake, along with a handful of freebies it should attract something? The other rods quick to follow, its out to the island and I put on a 'sticky toffee' boilie just as something different. Gary mirrors me with an All Seasons boilie cast close to the snags, but he tries something a little different with his other rod. We'd found last season that mussels attracted some interest, but not only from the fish, the birds liked them too! And just to have peace of mind we started wrapping them into small balls with 'armabraid', then threading them onto a long hair, so that's what Gary does, and lobs it out under the nearside overhanging trees, a couple of rods length out, and over the top of a few small balls of groundbait. Meanwhile I'm mixing up some groundbait as well, and this is deposited on my side of the tree, hopefully to build up the swim for later. It can't have been more than an hour later, and I'd walked round to see Gary and check he was all sorted for the evening then... beep, beep, weeeeeee! 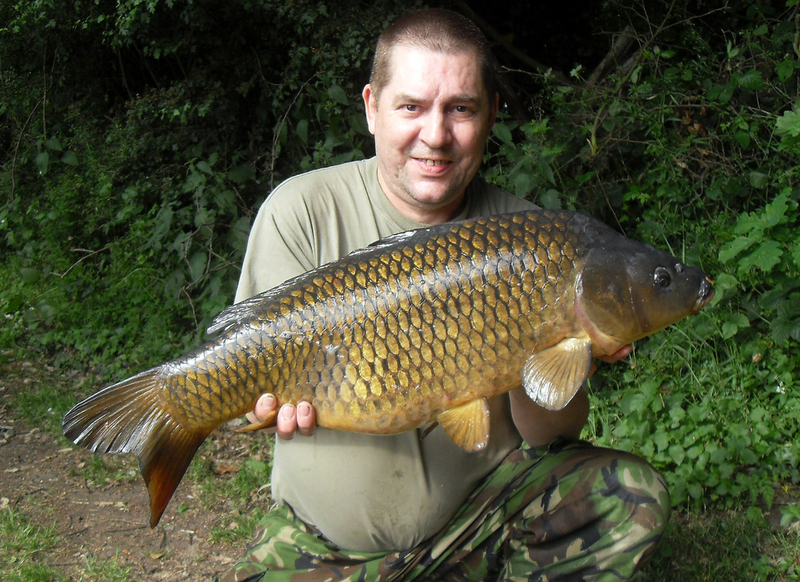 He was in, and in the deep near margins it was great to watch as Gary played a nice common to the net. It went 16lb 13ozs, not a bad start, could there be a few fish on the cards tonight? The mussels are getting some attention, but it's from just about every duck on the lake... always interesting to see Gary's version of the 'haka' as with landing net in hand he encourages the waterfowl to 'move on'! After some time they leave and gradually the sun begins to sink behind the trees. I've not had any action from my 'reed' rod, so before dark I put a couple of grains of floating artificial sweetcorn on the hair, this then gets dropped over my patch of groundbait I'd put out earlier. We have a last cuppa then it's into the sleeping bags and dreams of screaming alarms! My slumber is interrupted by distant beeps, I listen and hear the splash of a fish, a quick walk along the bank and I find Gary into a fish... the man's on a roll! It's a short fight and not long before a reasonable tench is brought over the edge of the net. We don't bother to weight it, as it won't better any PB's, and it's slipped straight back in. At last... but it's only a real beaten up tinca for me! There's no more excitement during the night, and besides the odd duck or coot in the very early hours, I've not had a touch. So once we've enjoyed a morning brew I'm changing my tactics again. This time I swap my lead for a cage feeder, which I pack with groundbait, then on the hook go 8 to 10 red maggots, and then its back out by the reeds. I keep re-filling and returning the feeder regularly, to build up the bed of groundbait, I'm sure there's a few bubbles coming up now, along the edge of the reeds. Then my alarm beeps, my indicator rises and I'm in... trouble is I've hooked a duck! Oh well, something likes the maggots, so I pop it back out, and not long after my patience is finally rewarded, a beep, then another, my indicator drops this time, I strike and wind quickly as the fish runs towards me. 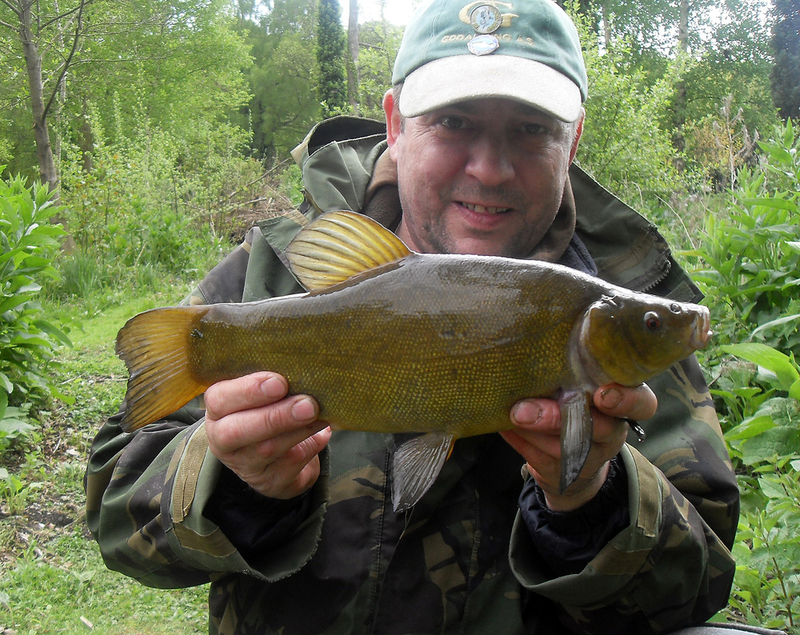 I get full contact and play in a tench, a very small, old warrior of a tench! It's a sort of consolation fish for me, it's been Gary's trip, a nice carp and a reasonable tench... well done mate, can't wait for next week! So we're back again, in the same swims, and doing the night. The wind isn't quite in our faces, but it's still blowing down this end. Gary's got here first (again!) and has already seen fish moving, so it's looking good. We decide to target the near end of the island, so Gary lays down a bed of boilies with the 'pult. The rods are sorted, and we both cast to either side of the baited area, then settle down with a nice hot cuppa. Both of us put out our other rods, Gary to the snags that produced last week, and me... well I'm giving the reed margin a miss as I only managed a small tench, so instead I fire a bait out parallel to the side of the island where I've seen fish rolling. There's a good splash, and we both see where a fish has topped... right over our baited area... it's looking good! 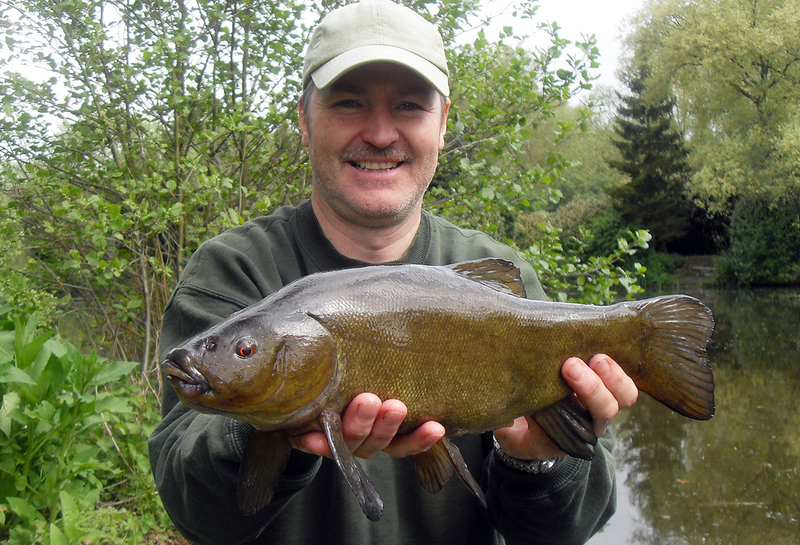 That's more like it, a reasonable tench, our target species? Over the next couple of hours we see, and hear, plenty of what seem like reasonably sized 'lumps' crashing on the surface. Some we can see are tench, but most are carp, and quite a few are right in our target spot. Gary has had a couple of beeps and a tug on his line just to prove they're there, and it's not long after that I hear a screaming take from his swim. I walk over and sure enough Gary's playing a spirited fish, which he steers expertly into the net... it's not a carp this time, but a nice sized male tench. Onto the mat, out comes the hook, and it's into the sling... 6lb 7ozs, Gary reckons that's a PB male for him, what a nice start to the session. So the light fades and we finally turn in for the night. Fish continue to jump and crash regularly through the wee small hours but our sleeps not interrupted. I hear Gary have a few beeps but it doesn't result in a run, oh well, it's nice to have a peaceful kip! The sun comes up, and the day continues in much the same way, with nothing giving us a lot of excitement... actually I'm wrong, as early in the afternoon Gary finally gets a run. He plays what he reckons is a carp, and not very big at that, it comes to within a few feet of the bank then does a quick turn and somehow slips the hook... carp 1, us 0. And that's about as good as it got, with neither of us having any more action... but that's why it's called 'fishing' and not 'catching', it's nice to be out in lovely surroundings and in good company, having a cuppa, reading a book, enjoying the banter, roll on next time! A couple of small lakes surrounded by mature trees, with spreads of lily pads laying here and there amongst the little bays and inlets, as groups of tiny bubbles 'fizz' to the surface suggesting the presence of underwater denizens.... sounds good doesn't it? Well that's what Gary and myself thought, with the promise of some warmer weather, and after a few hard weeks on the canal chasing the 'invisible' carp we headed off to a lovely club water near Bishops Stortford. We'd heard from a friend of ours that had fished here recently that raking your swim first seemed to really bring the fish on. 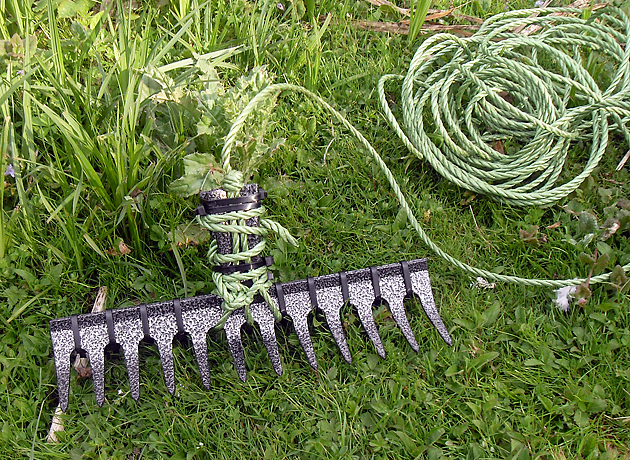 So Gary set out to grab a couple of rake 'heads' to make up a suitable tool, but the problem was he couldn't find any 'heads', only fully handled rakes... well they'd certainly make a big splash then! Unperturbed Gary popped the rivets and whipped off the handles before setting the heads back-to-back. He then held them together with plastic 'ties' fastening them between each prong, and finally tying on a length of rope to allow us to retrieve our fearsome weapon once we'd hurled it into the dim distance! We arrive at about 6am and it looks gorgeous, with the rising sun peaking out through the trees. Gary and I walk along the bank of the nearest lake to pick our swims, also keeping an eye out for anything moving about. Then its back to the cars, unload the tackle and move it all into our chosen locations... well this is certainly better than working! Out comes the rake, and Gary's handywork is put to the test, with a splash it enters the water and Gary slowly drags it back in.. it works perfectly. Strands of weed cover the rake, and we take it in turns to clear each swim, but a bit of advice, make sure you're not standing on the rope as you throw.. as one, it doesn't go very far, and second, you don't half get wet! Our methods for this outing were simple, a float rod and a feeder rod each. 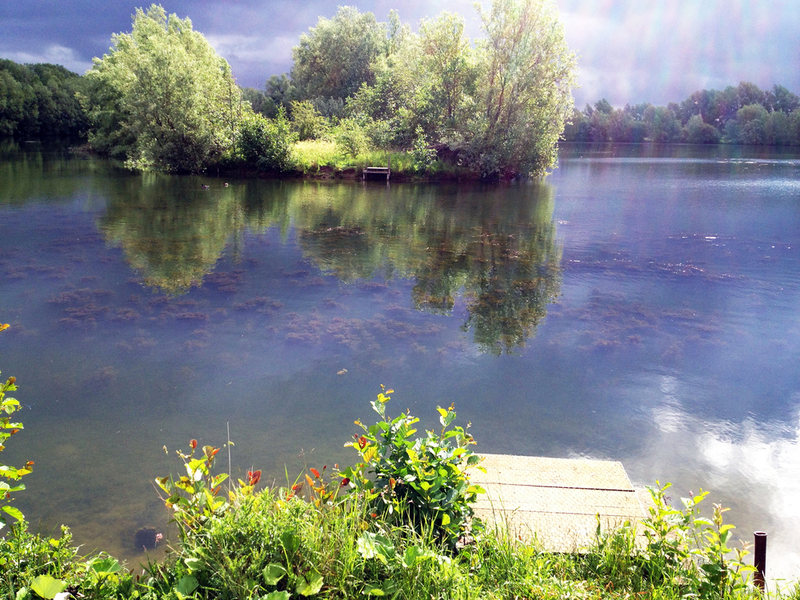 The lake holds tench, carp, F1's (cross between crucian and common carp), ide, crucians, and the usual silver fish, and so with tench around you have to have a go with a float. Gary fishes straight depth, using a pole float to give him a very sensitive presentation, I on the other hand try the 'lift' method, a great technique for tench and hopefully it will help with any finicky crucian bites. Well we give it an hour or so and to be honest, not a lot happens. The odd few bubbles, the occasional rise, but nothing to really make us feel the swims are coming alive.. I notice Gary has pulled in his rods and gone for a wander, he soon returns and I've an idea what he's going to say... it's time to move. We head further round the venue to the adjacent lake, and pick a couple of swims that look, well more 'tenchy', and that seems likely as when we start raking again we're now pulling in heaps of weed, and soon clear a couple of good channels to fish to. When the raking has finished its in with the groundbait, laced with hemp, casters, and small pellet. Not long after Gary lands our first catch, a small perch, taken on red maggot and on his feeder outfit. We're both finding that the floats are doing nothing, with hardly a touch between us, so we switch to a second feeder rod each... who says that means we can nod off now if we get sleepy?!! But we don't, and after a cuppa or two, I'm looking at my indicators when one of them shoots up and my buzzer gives out a short, sharp beep, I lift the rod and feel the pull and jagging of what can only be a tench. As always its a dogged fight, even from what turns out to be only a 3lb 'tinca', but lovely all the same. Gary checks we have the same set up on our feeders, and we have, both using a paternoster style rig with a small cage feeder on the main line and the hook fastened on the other, shorter line, allowing the feeder to hit the bottom, even dropping through any residual weed while allowing the hookbait to float down slower, and hopefully land on top of any foliage. 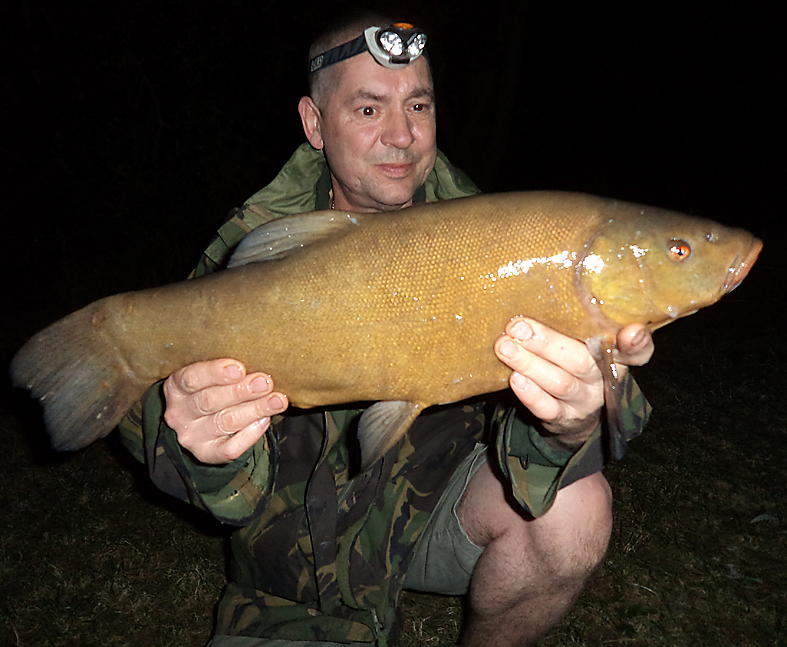 I'm lucky and not long after I'm in again and another tench joins us on the bank. A little later and Gary has a good bite and it's the first F1 of the day, not that I'm going to enjoy playing any as Gary procedes to catch them regularly throughout the afternoon! We both have false bites, half attempts, and quick pulls that result in nothing, just to tease us, but in between Gary has a tench, and even hooks an Ide that decides to escape the hook at the net, well that's fishing, and after a barren few weeks its nice to get a bend in our rods... it's been a lovely day. At last he's caught the right species!